Timing is paramount and our team are there to get your fuel system installed and operational as fast as possible. 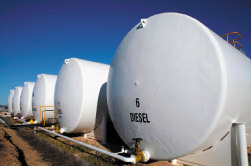 We can assist in the design and engineering of fuel farm requirements from 20KL to 2000KL. Rent, lease and buy outright options. Short and long term rental options available. inventory control systems can be canvassed and a solution that best suits your application sourced. Key Fob Systems, automated card access, automated tank monitoring can be combined to produce a system that best suits your application.